Detailing the physical features, habits, territorial reach and other identifying qualities of the Grape Leaffolder. Active during the day, the Grape Leaffolder can have an impact on grapevines in one summer and then fruit production in the next. Often found near grapevines, the Grape Leaffolder is a visitor growers prefer to never encounter. Easy to spot thanks to its black wings and large, obvious white ovals, one would think the adult is the main nuisance, but it is the larvae of this species that proves the bigger pest. Caterpillars start out a pale orange, and become a paler yellow with blackening inside the body as it ages. The orange head has black blotches on the sides of the 'collar'. 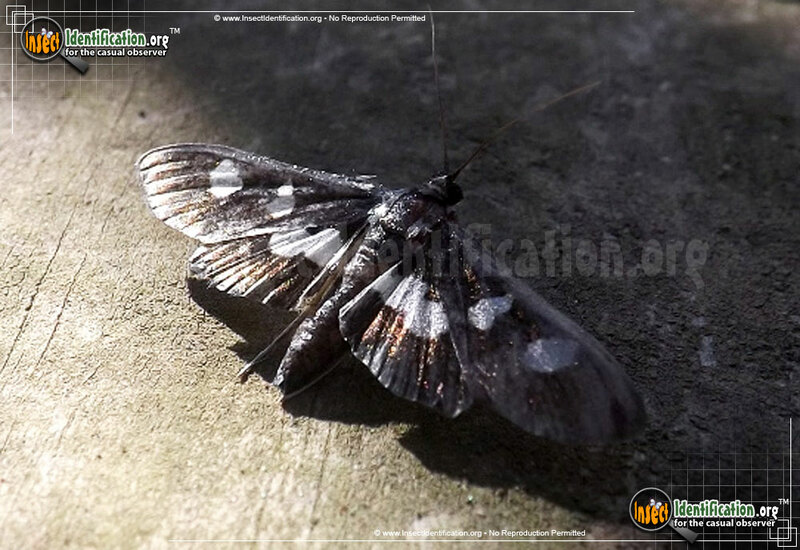 Two black spots on each side of the first segment are at the start of a line of translucent spots along the body. They feed on evening primrose, redbud, and, of course, grape leaves. Groups of larvae use their strong silk to tie bunches of leaves together. Each caterpillar will choose a leaf for itself and roll, or fold it up, creating a tube to both hide in and feed off of by day. The way they eat leaves only the skeleton of the leaf behind. At night, the caterpillars move on to fresh leaves. Once summer is over and leaves begin drying out, caterpillars fold down the edges of the leaf they are inside and eventually fall to the ground with it. They pupate in this protective, inconspicuous cover and emerge as winged adults in the spring. Sections of mature vines with new, lighter green foliage that appears to take the place of missing leaves may indicate the presence of caterpillars. Small patches of infestation can be tolerated. If too much leaf coverage is eaten, ripening grapes may experience damage from overexposure to sunlight. Parasitic wasps, predatory flies and other insect-eating bugs help to naturally reduce the population of Grape Leaffolder caterpillars. Spraying appropriate insecticides on the vines that are affected is also effective. Populations without any kind of control can chew up enough foliage to weaken a vineyard's crop, causing the plants to spend more energy that year to replace leaves, leaving less energy for heavy fruit production the next year.